Russian conductor to perform farewell tour in Europe and U.S. in October. From Oct. 9 to 25 Valery Gergiev will give his last concerts as Principal Conductor of the London Symphony Orchestra (LSO) in London, and on tour in Vienna, Luxembourg, Paris, Newark and New York. After the end of the season Gergiev will be replaced by Simon Rattle as Principal Conductor of the LSO. 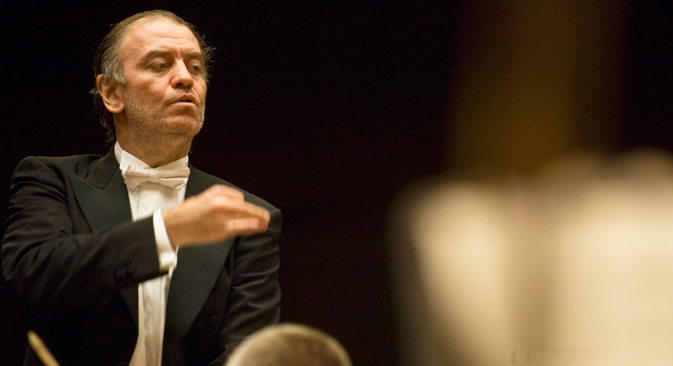 “Gergiev will take over as chief conductor of the Munich Philharmonic Orchestra in season 2015-2016,” the conductor's press secretary told TASS. The programs feature ballets and orchestral works by Bartók and Stravinsky, including Stravinsky’s The Firebird and The Rite of Spring, plus Bartók’s The Miraculous Mandarin, Concerto for Orchestra and Piano Concertos Nos 2 & 3 with soloist Yefim Bronfman. After a highly successful cycle of Prokofiev’s Symphonies with the LSO in 2004, the Orchestra’s centenary year, Valery Gergiev was appointed Principal Conductor, taking up the post in 2007. He began his tenure with a complete cycle of Mahler’s symphonies in the 2007/08 season, and in 2008/09 focused on Rachmaninov’s symphonies and other Russian repertoire. The performance of Prokofiev’s Romeo and Juliet, recorded for LSO Live, the Orchestra’s record label, went on to win Disc of the Year at the BBC Music Magazine Awards in 2011. In 2010/11 he turned to compatriot Rodion Shchedrin and began a complete cycle of Tchaikovsky’s symphonies. The cycle was completed in the 2011/12 season, which Gergiev opened with a concert featuring the three winners of the XIV International Tchaikovsky Competition, including pianist Daniil Trifonov making his LSO debut. In 2012, Gergiev inaugurated the BMW LSO Open Air Classics series, the Orchestra’s annual, free, open-air concert in London’s Trafalgar Square. He has conducted each subsequent Trafalgar Square event to an enthusiastic crowd of thousands of Londoners and visitors from around the world. Gergiev has led the LSO on major tours of the U.S., Russia, Europe, China and Japan, as well as a highly successful tour to Australia in 2014, the Orchestra’s first visit to the country in more than three decades. He has regularly conducted the LSO at the Orchestra’s residencies at Lincoln Center in New York, Suntory Hall in Tokyo and Paris’ Salle Pleyel, as well as conducting the Orchestra’s first performance in the new Philharmonie de Paris in February 2015. “Valery’s tenure as principal conductor has seen much great and inspiring music-making with the LSO,” LSO managing director, Kathryn McDowell, said. “His profound knowledge of Russian repertoire in particular has led to many truly memorable performances and also a strong legacy of recordings on LSO Live. His immersive approach to programming has brought us great insight into the orchestral canons of Prokofiev, Rachmaninov, Tchaikovsky, Scriabin and Szymanowski, among others, and fascinating insight into less-well-known composers such as Shchedrin,” she added.